I’ve done episodes on preserving herbs, using herbs IN your canned goods and I on how to dry herbs for long term storage. But this episode is on the many wonderful uses for FRESH herbs. It is peak growing season right now for herbs and even if you don’t grow any yourself, you are probably seeing a lot herbs at the farmer’s market. 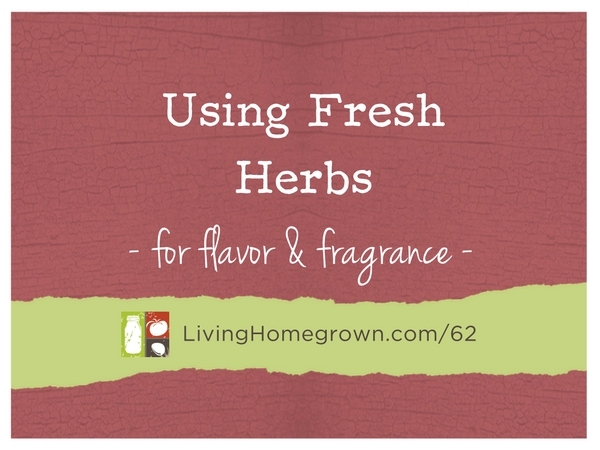 So this episode and post is all about how to utilize those herbs for both flavor and fragrance. As always you can read the full transcript and get all the links mentioned below. I’ve put together a really great freebie for you. Click the box below to get my favorite list of herbs for flavor and fragrance. I have also included my favorite nurseries so that you don’t have to hunt down the more unusual varieties. How long will the dried herb sachets last. I was thinking of making some this summer/fall to use as gifts for Christmas. It sort of depends on the herb. Some hold their fragrance and oils longer than others. But for lavender, making them 6 months ahead would not be a problem. Lavender holds it’s fragrance well. What I would suggest is that you make your sachets now (no matter what type) and store them in an air tight container (like a glass jar with a lid) and they will be just fine for Christmas gift giving. Hope that helps. There’s a pic above of garlic in a canning jar in their skins.